Milly Lee grew up in San Francisco’s Chinatown as Mildred Chan in a household where grandparents, parents, siblings, aunts, uncles, and cousins all lived under one roof. She attended Chinese school after the regular school day and spoke Cantonese at home and in the neighborhood. Up until the end of World War II, Chinatown was a small, close-knit community whose members were under pressure to conform to the ideals of Chinese culture.When she was a child, Milly found few books about children like herself. There were some Asian stories, but they were set in an exotic land of long, long ago. Milly felt strongly that stories of bicultural children and their experiences needed to be voiced, so that they would see their own likeness in books. A retired school librarian who had been very active in the American Library Association, among other professional associations and organizations, she knew exactly what she wanted her first book to be.Nim and the War Effort is an autobiographical story, but it speaks directly to the experiences of all bicultural children in their struggles to find out who they are. In it, a young Chinese American girl, trying to prove her patriotism during World War II, risks her family’s disapproval by leaving Chinatown to collect newspapers for the war effort.Milly revisits Chinatown in Earthquake. Basing her story on her mother’s experiences in the 1906 San Francisco catastrophe, she tells of the family’s escape across the burning, crumbling city to safety. With an endnote explaining the details of the quake, and including newly discovered information, Earthquake gives readers a fascinating picture of a city coping with an emergency; it is also a moving tribute to the hundreds of Chinese Americans who lost their homes, and in some cases their lives, in that disaster.Landed, Milly’s most recent book, is also based on a true story, that of her father-in-law and his experiences as a boy immigrating to the United States from China in the early twentieth century. Because of the 1882 Chinese Exclusion Act, he and other new immigrants were detained at Angel Island, California, where, whether or not they were legitimate sons, they had to pass a difficult interrogation before being allowed into the country. Milly found that the people who had been incarcerated there didn’t speak about their experiences because they feared their legal status would be challenged.Milly was asked recently what her books are about, which set her to thinking that her books have a more common thread than she had realized: “I have thought of them as stories based on my own and my family’s experiences. I believe they provide some insight into how we lived within our own culture and how we lived segregated from the larger community. The stories are from the perspective of people outside the mainstream who have been left out of the stories of the times, in our case, of World War II and the San Francisco earthquake and fire. Chinese Americans were part of those events; their experiences were just a bit different from other American stories of the period. I wanted to let readers know that ‘we were there, too’ . . . When I talk with school groups, minority students such as the Hispanic school population are often surprised that other people faced these issues as well. I feel it’s important for them to know that and to know that they are not singled out, that their immigration problems are similar to those of other groups who have wanted to come to America. 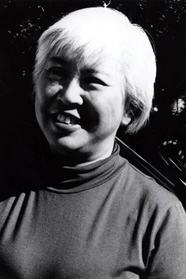 Teachers have told me that my books have helped to open discussions on racism with their students.”Since she retired in 1991, Milly, besides writing, travels with her husband, Kearn, to many of the places they read about but never dared to dream of going when they were growing up in San Francisco’s Chinatown. Milly Lee, the mother of three and grandmother of six, lives in San Francisco, California.